Perhaps it is no surprise that in a city made famous by beer, Schlitz Brewing brought the circus to the streets of Milwaukee by sponsoring the first Great Circus Parade in 1963. As a fundraiser for the Circus World Museum in Baraboo, Wisconsin, the Great Circus Parade featured animals, circus wagons, marching bands, wagons, clowns, and circus performers. 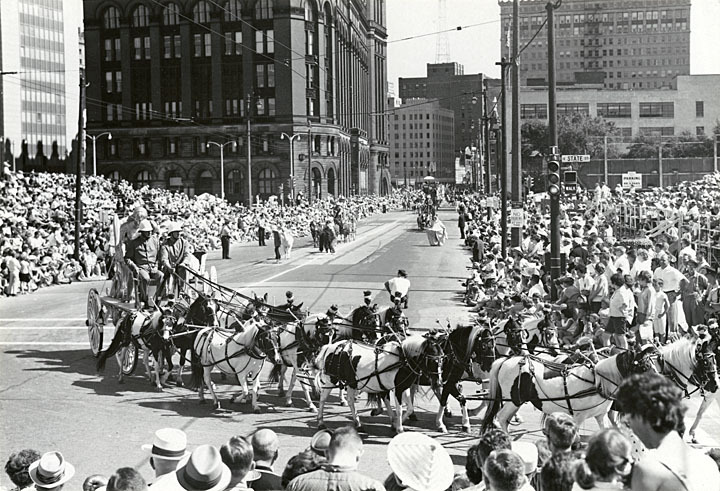 The parade, held twenty-nine times in Milwaukee, attracted tens of thousands of spectators each year, making it one of the largest spectator events in the state. The Great Circus Parade honored the many circuses that had originated in Wisconsin. The most prominent circus in the state was founded by the Ringling Brothers, whose family had moved from Iowa to Baraboo when the boys were young. In 1884, five of the brothers founded the Ringling Brothers Circus in their home town. In 1907, the brothers bought out their largest competitor, the Barnum & Bailey Circus, to create one of the largest circuses in the United States. The Ringling Brothers Circus normally went into winter quarters in Baraboo, Wisconsin, now the site of the Wisconsin Historical Society’s Circus World Museum. The Great Circus Parade was born of the collaboration of C.P. “Chappie” Fox and Ben Barkin. Fox, a self-taught circus historian, was director of the Circus World Museum in Baraboo from 1960 to 1972. He focused on finding and restoring antique circus wagons from all over the United States, eventually accumulating over 120 wagons and other circus vehicles. This trademark of the museum was expensive, and Fox turned to Ben Barkin, a Joseph Schlitz Brewing Company public relations specialist in Milwaukee to raise interest and funds for the expansion of the Circus World Museum. They convinced the company to finance a parade. The parade format represented a period in American history, the late nineteenth and early twentieth centuries, when circuses traveled by rail from town to town. They held parades in each city to attract publicity and paying customers, with bands, “wild” animals, and elaborately ornamented wagons. The Great Circus Parade featured its own train, which traveled the 200-plus miles from Baraboo to Milwaukee by way of northern Chicago suburbs like Arlington Heights, Barrington, and Palatine. 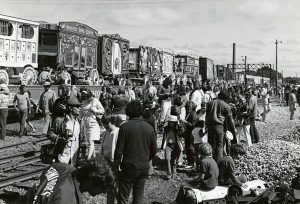 Once the parade train arrived in Milwaukee, the public was invited to Veterans Park on the lakefront to get close looks at the animals, circus performers, and wagons. In 2009, the last time the parade was held, the Great Circus Parade Festival ran for four days prior to the parade. The first parade was held in Milwaukee in 1963. A few years later, after renowned actor Ernest Borgnine revealed to Tonight Show host Johnny Carson his dream to play a clown, Barkin proposed that the actor appear in the parade. The Oscar-winning actor appeared as the “Grand Clown” in every parade held over the next three decades. Even a hiatus from 1973 to 1985 could not permanently derail the parade. After its return in 1985, the Great Circus Parade continued to attract thousands of spectators and various celebrities. In 1988, Spuds MacKenzie, the bull terrier who famously represented Budweiser Brewing rode in a carriage in the parade. In the same year, the parade featured the world’s oldest circus carriage. The 2009 parade featured over 50 carriages, along with clowns, bands, and exotic animals (in 1989, there were a total of 750 horses in the parade). One of the most dynamic attractions of the parade for a number of years was Iowa farmer Elmer Sparrow’s 40 Horse Hitch. The feat had not been attempted since 1904, when horses were still used to move circuses into town, but Sparrow brought his team to the parade a number of times in the 1960s, 1970s, and 1980s. The parade has faced its share of difficulties. The parade was cancelled in 1968 due to racial tensions in the wake of the assassination of Dr. Martin Luther King, and in 1994, four Clydesdale horses broke free from a wagon, bolting into the crowd, and injuring at least ten spectators. Early in its existence, mayors of cities such as Chicago and New York attempted to have the parade moved to their cities. However, Barkin refused to see the parade leave Milwaukee. He stated “no one else can do this parade, because no one else has the wagons.” But the primary difficulty over the years was lack of funding. Indeed, for most of the 1970s and early 1980s, the lack of sponsors forced the parade into a twelve-year hiatus, from 1973 to 1985. Due to lack of financing, the parade was officially cancelled after 2003 parade; founder Chappie Fox died in the same year (Ben Barkin had died in 2001). However, in 2009 Bill Fox, Chappie Fox’s nephew, helped lead the effort to raise $1.5 million to hold the parade one last time. ^ John Gurda, The Making of Milwaukee, (Milwaukee, WI: Milwaukee County Historical Society, 2006), 357. ^ “Charles P. (Chappie) Fox, 90, Driving Force behind Famed Circus World Museum, Founder of Annual Great Circus Parade,” The Capital Times, accessed April 15, 2015. ^ “Bailey and the Ringlings,” Ringling.com, http://www.ringling.com/ContentPage.aspx?id=45833&section=45825, accessed April 15, 2015. ^ Brian Downes, “Homage to a Circus Legend,” Chicago Tribune, December 30, 1999. ^ “C.P. ‘Chappie’ Fox,” Parade Wagons, accessed April 15, 2015. ^ Carrie Antlfinger, “Great Circus Parade Returns to Milwaukee,” The Journal Times, July 11, 2009. ^ Rogers Worthington, “A Day like No Other When Circus Parades to Town,” Chicago Tribune, July 13, 1989. ^ “The Great Circus Parade Returns to Milwaukee,” VISIT Milwaukee, accessed April 18, 2015. ^ Georgia Pabst and Jackie Loohauis-Bennett, “Borgnine Treasured Role in Milwaukee’s Great Circus Parade,” The Milwaukee Journal Sentinel, July 8, 2012. ^ “The Great Parade Revisited,” The Milwaukee Journal Sentinel online, http://www.jsonline.com/entertainment/45669347.html, accessed April 18, 2015. ^ “Sparrow Was Big Finale with 30-Horse Hitch,” Milwaukee Journal Sentinel, December 29, 2010. ^ “Circus Horses Go Wild,” The Journal Times, July 18, 1994. ^ Rogers Worthington, “A Day like No Other When Circus Parades to Town,” Chicago Tribune July 13, 1989. ^ “Great Circus Parade Returns to Milwaukee after Six Years,” USA Today, June 29, 2009. Apps, Jerry. Ringlingville USA: The Stupendous Story of Seven Siblings and Their Stunning Circus Success. Madison, WI: State Historical Society of Wisconsin, 2005. Davis, Janet M. The Circus Age: Culture & Society under the American Big Top. Chapel Hill, N.C.: The University of North Carolina Press, 2002. Fox, Charles Philip, and F. Beverly Kelley. The Great Circus Street Parade in Pictures. Mineola, N.Y.: Dover Publications Inc., 1990. Gurda, John. The Making of Milwaukee. Milwaukee, WI: Milwaukee County Historical Society, 2006.